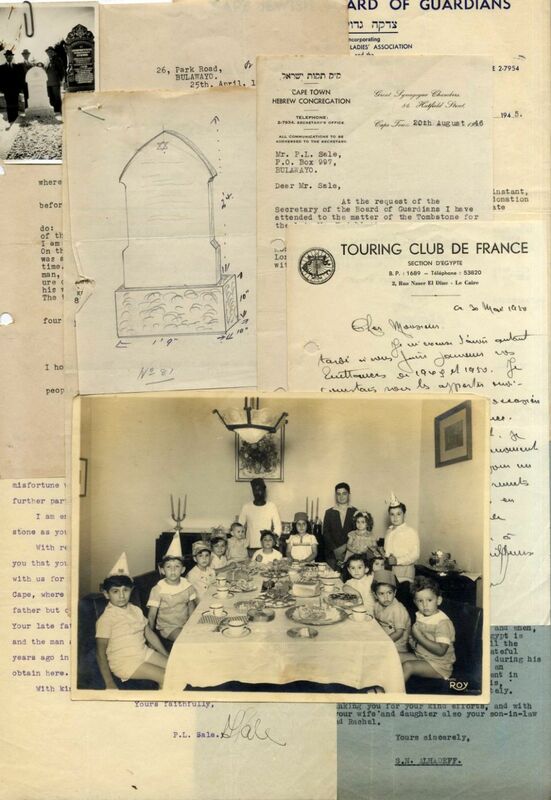 Collection of photos and documents - Jewish family in Alexandria 1945-1947. * 9 pictures from the life of a Jewish family in Egypt: costumed children enjoying a Purim feast, group picture of children during Chanukah, a Jewish nursery school, a Jewish family, family near a relative's grave in Egypt, and more. *  documents - most correspondence from the Paul Weinblatt family to various authorities: [including the chevra kadisha] regarding the purchase of a burial plot in the Jewish cemetery in Alexandria [with a sketch the shape of a Jewish tombstone] for the deceased family patriarch Mr. Weinblatt, and arrangements regarding his bequest. Stencil print with signatures of various authorities. Varying sizes and conditions, overall fine condition.